This may not be a romance, but I just love my country music, so thought, I can’t be the only one! I figured this was worth a share. Enjoy! The true story of Merle Haggard and Freddy Powers. “Let’s Chase Each Other Around the Room Tonight,” “I Always Get Lucky With You,” “Natural High,” and “A Place to Fall Apart” among countless others. Merle Haggards talents and words are alive in this book. 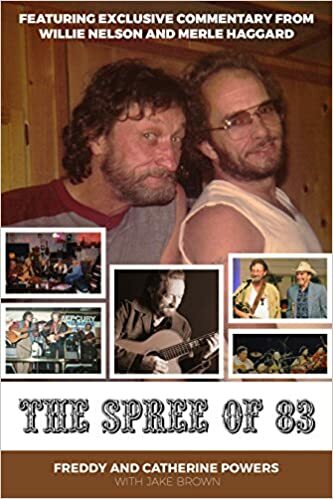 FOREWORD by: Tanya Tucker and contributors to include: Willie Nelson, John Rich, Marc Oswald, Bill McDavid and Sonny Throckmorton to list a few. John Rich from Big & Rich and or Tanya Tucker are also available to do interviews for this book. Blackstone Audio has licensed Audio Rights for this book! Sizing up Powers’ influence on country music, Country Music Television has noted that throughout his 50-year career, Powers has “demonstrated a dedication to broadening the perimeters of country & western, particularly in creating a fusion of country honky tonk and swing jazz. This interest runs throughout Powers’ career,” while his hometown Austin Chronicle has affectionately concluded that “Powers’ name stands alongside some of country music’s most enduring classics.” Now, for the first time, in the pages of his memoirs, “THE SPREE OF ’83,” Freddy recounts first-hand the highly-entertaining and emotionally-touching story behind his decades-long roller-coaster ride through the music business, to the top of the charts, and his inspiring struggle in recent years battling Parkinson’s disease, all while his legacy endured through generations of fans. Helping Freddy tell his story are exclusive interviews from fellow country music legends WILLIE NELSON, MERLE HAGGARD, John Rich, Tanya Tucker, The Voice finalist/Powers’ protégé Mary Sarah, and hosts of other Nashville luminaries.